I have so many exciting things coming up over the next couple of weeks... Nail art I'm super pumped to share with you, a look at my first stamping mat, a review of Born Pretty's clear stamper, a review of a tea subscription box... Lots of awesome things! Today we have a look at a nail art design I original identified as a "nail fail" and which I didn't intend to ever actually share with you... But taking another look at it I decided it wasn't nearly as bad as I had convinced myself it was, and that it was actually pretty cute! Okay! So how did I get this look? Well, I started off with a base of OPI Small + Cute = ♥ (don't you just love that name?!) 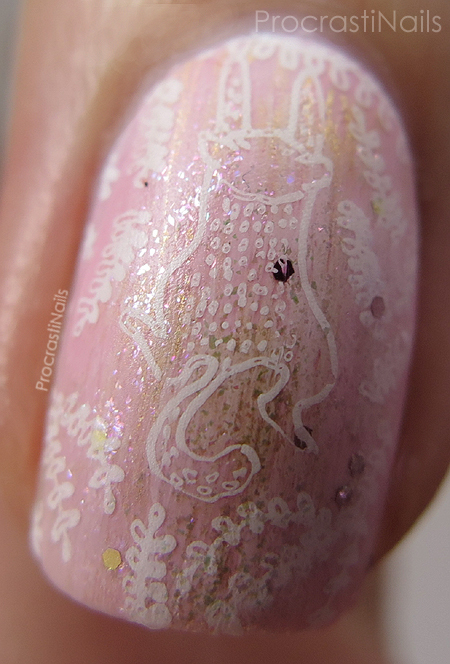 and then did a quick dry brush with OPI Charmmy & Sugar, and when that was dry I stamped my cute coordinating kitties with Konad White Stamping Polish and MoYou London Enchanted Plate 13. A layer of top coat and some gems and it was done! 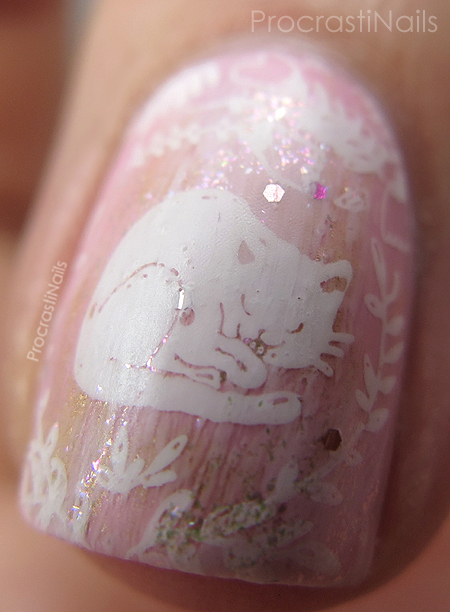 Let's look at some close-ups of those stamped kitties now! I have named this one Trevor and imagine he has fallen off the garden wall. Damnit, Trevor! And this is Muffy. Because she looks like a Muffy to me. Cat names don't need justifications! The reason I feel like this mani was a bit of a fail was because my stamping designs and colors don't really allow the images to pop, the dry brush with the glitter is a bit too much and takes away from the design, and I really think the pink gems were a bit of a mistake... But it's still a cute mistake, so that's okay. :) Kitties make everything better, and who doesn't like kitties?! The stamping is so cute and the polish is so girly. The stamping is very subtle but you did with the base is stunning! Umm, yeah there's no way that this was a fail! It's lovely! That pink is darling! Stamping with cats just seems logical here. So pretty! The softness of the overall look works very well with the image, so I don't think it's a fail at all! The subtlety of this is adorable - sometimes something you think is a fail doesn't come across that way to the rest of us at all! 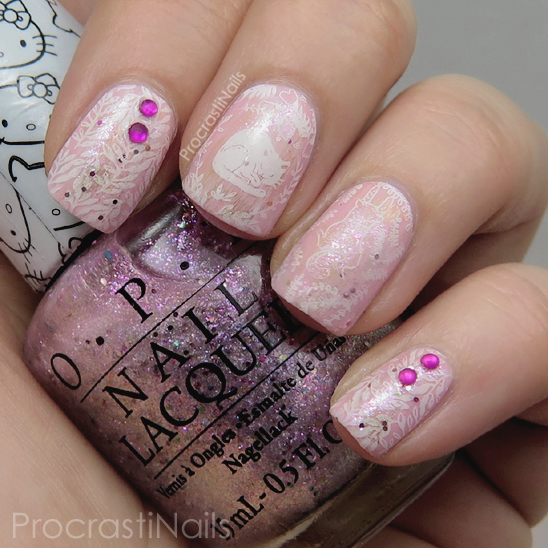 Oh the cute kitty stamping is adorable! I think the subtlety and "lack of pop" is actually really nice on this mani. It has a different impact when you really lean in to see those sweet little kitties! 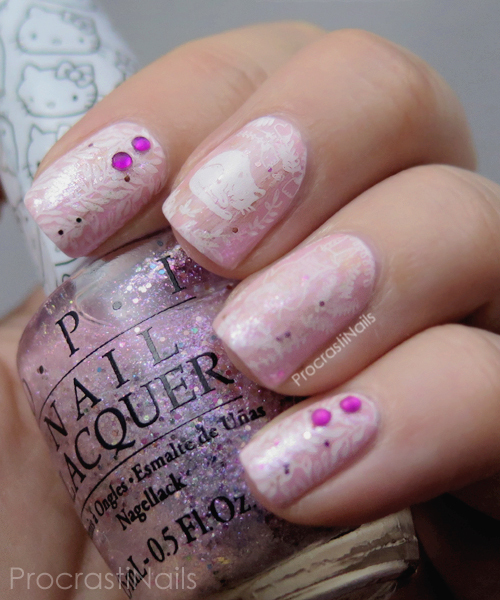 I actually really like this mani! The kitties are adorable!